Bitter melon, known as “ampalaya” in Philippines is a super-fruit packed with nutrients, vitamins, and minerals. It contains a plant insulin called polypeptide-P known to lower blood sugar levels. 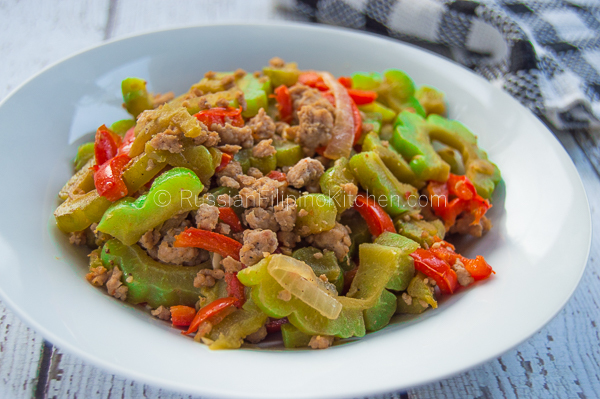 Though beneficial to the body, many people get discouraged from eating any ampalaya dish due to its bitterness. It’s an acquired taste which some Filipinos are able to develop over time. I personally love “paliya” (bitter melon in my dialect) sautéed with meat or with other vegetables, in pinakbet, added in fish paksiw, and in soups. Its bitterness doesn’t bother me. 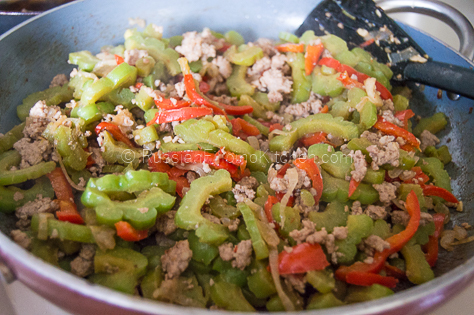 But when I’m serving an ampalaya dish to someone else, I try to reduce the bitter taste it by sprinkling the sliced pieces with a generous amount of salt and allowing it to sweat for some time. After 15 minutes or so, I squeeze some of the juice out while rinsing in cold water. 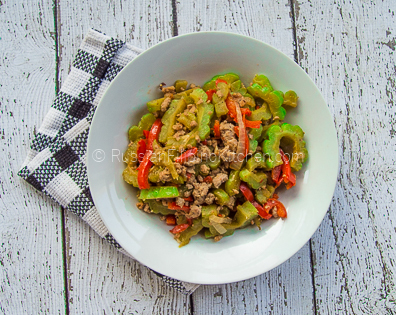 This recipe is for sautéed ampalaya with ground pork and bell peppers. It’s a nice variation from the usual ampalaya with eggs. 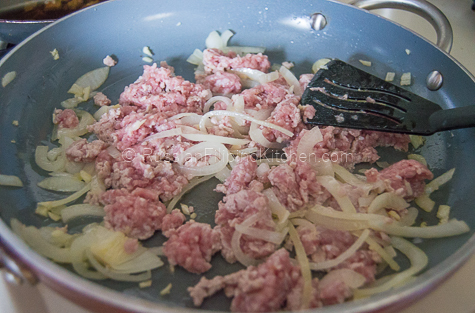 I use extra lean ground pork, hence the use of olive oil for sautéing. 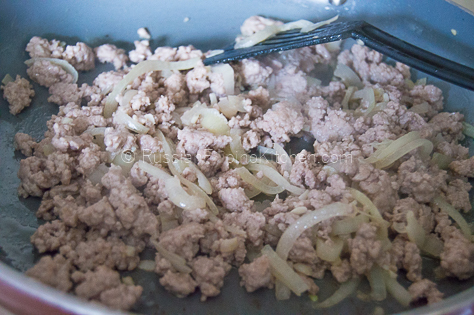 However, if you’re using regular ground pork with a little fat, skip the oil, and just use the rendered fat to sauté. 1. 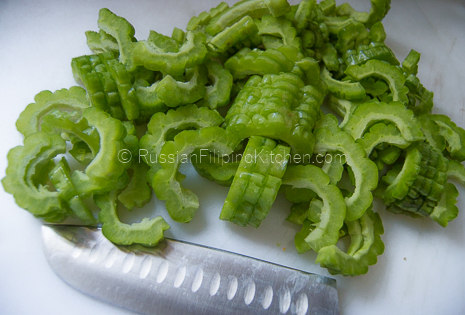 Wash ampalaya and trim the ends with a knife. 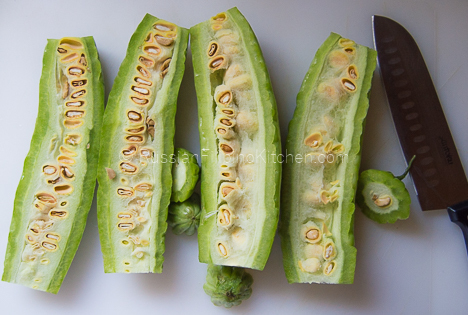 Cut in half lengthwise to expose the seeds. 2. 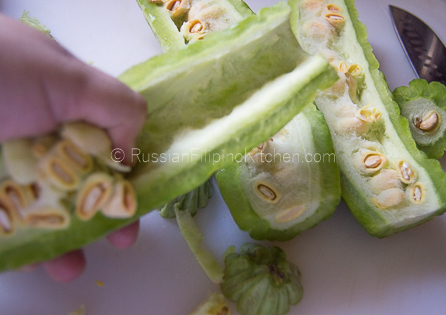 Remove the seeds by running your thumb from top to bottom of every halved ampalaya. 3. Slice into 1/8 inch thick. 4. 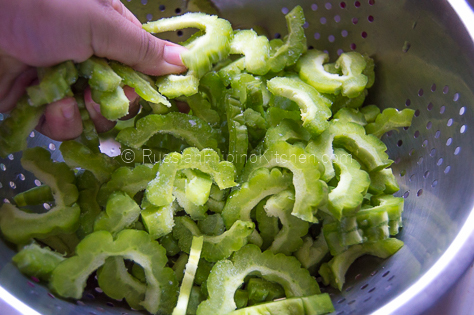 Place ampalaya slices in a colander. 5. Sprinkle with a teaspoon of salt. Mix with your hand to distribute the salt evenly. Set aside for at least 15 minutes. 6. 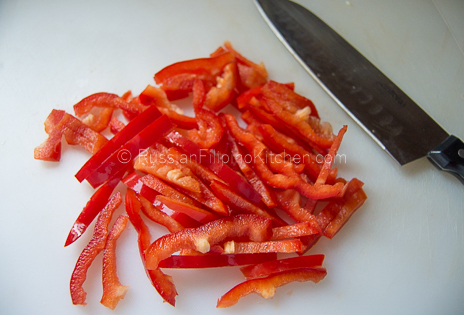 Wash bell pepper and remove the seeds. Slice into strips, about 1/8 inch thick. 7. Peel onion and slice thinly. Similarly, peel garlic and mince. 8. After 15 minutes has passed, rinse ampalaya under cold running water while squeezing gently to wash away the salt and remove the bitterness. Drain excess water. 9. Heat up a large sauté pan over medium high heat and add the oil. 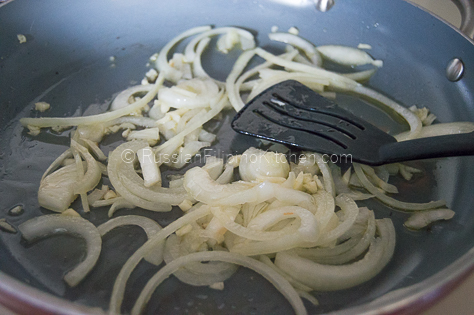 Saute onions and garlic until fragrant, about 2 minutes. 10. 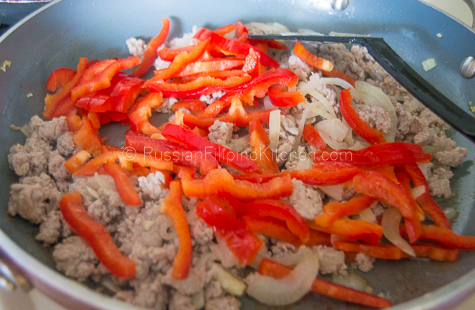 Add ground pork and sauté for 5 minutes until no longer pink. 11. Throw in bell peppers and sauté for 3 minutes until slightly wilted. 12. 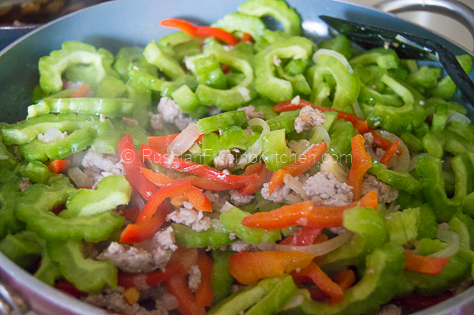 Add ampalaya and sauté for about 10 minutes until softened. 13. Season with soy sauce, salt, and ground black pepper. Mix. 14. Saute for additional 5 minutes until thoroughly cooked. 15. Serve hot. 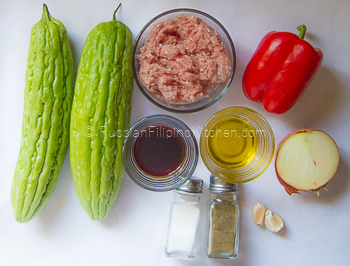 Wash ampalaya and trim the ends with a knife. Cut in half lengthwise to expose the seeds. 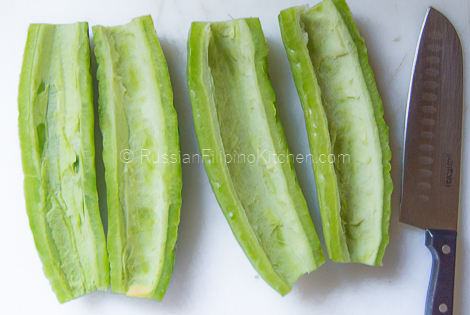 Remove the seeds by running your thumb from top to bottom of every halved ampalaya. Slice into ⅛ inch thick. 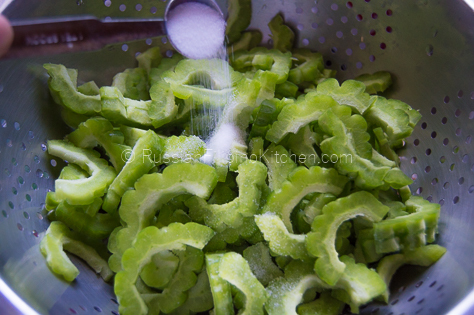 Place ampalaya slices in a colander. Sprinkle with a teaspoon of salt. Mix with your hand to distribute the salt evenly. Set aside for at least 15 minutes. 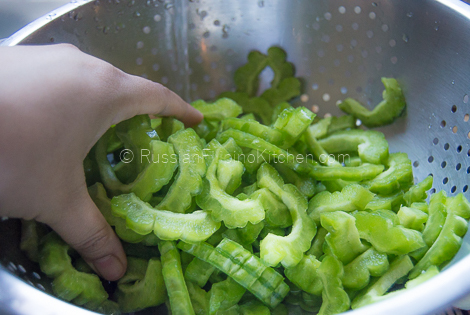 Wash bell pepper and remove the seeds. Slice into strips, about ⅛ inch thick. Peel onion and slice thinly. Similarly, peel garlic and mince. After 15 minutes has passed, rinse ampalaya under cold running water while squeezing gently to wash away the salt and remove the bitterness. Drain excess water. Heat up a large sauté pan over medium high heat and add the oil. 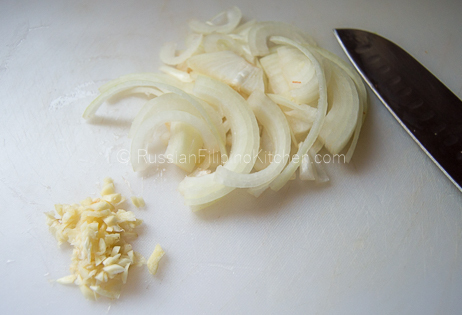 Saute onions and garlic until fragrant, about 2 minutes. 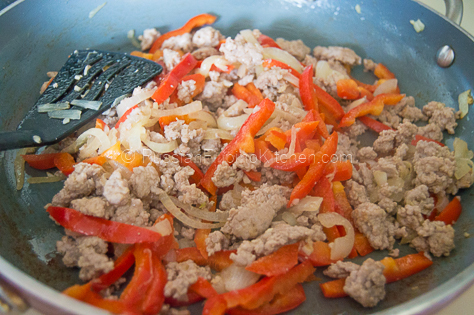 Add ground pork and sauté for 5 minutes until no longer pink. Throw in bell peppers and sauté for 3 minutes until slightly wilted. 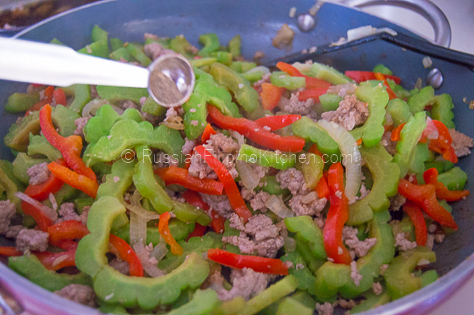 Add ampalaya and sauté for about 10 minutes until softened. Saute for additional 5 minutes until thoroughly cooked.